Few will remember that the first Canadian act to make the UK singles chart was the Four Lads back in 1952 when they accompanied Johnny Ray on his hit Faith Can Move Mountains. If you were asked who was the first Canadian act to have a number one hit, more will remember that it was Paul Anka, but who was the second? Well, it took nearly 17 years for that to happen and it was Terry Jacks when he hit the summit with Seasons in the Sun in 1974. Channel 4 classed Terry Jacks as a one-hit wonder, but he had graced our chart before that. Terry was born in March 1944 in Winnipeg, Manitoba but he, with the family, relocated to Vancouver in 1961. As a lad he learned guitar and then, at the age of 18, formed his first band called The Chessmen with a guitarist friend Guy Sobell and charted four local hits between 1964 and 1966. In 1967 Terry and Susan married and went on to have a couple of minor hits in Canada with Beyond the Clouds and What Can the Matter Be which led to them securing a deal with London Records. They went into the studio and when Susan did her vocal for this song, Terry thought it was perfect, in fact too perfect. The couple, argued over whether or not she should redo her vocal, and Terry convinced her to give it another try. “The next day we went in and she did it first take,” he said. “She was so tired and worn out and she captured the feel. It fit the song. The other performance was too happy.” They didn’t initially have enough money to pay for the studio, so Terry offered the record label a deal, Terry explained, “We initially offered the studio a ⅓ of the royalties from the sale of the single because we didn’t have enough money to pay for the session. However, after I mixed the track I realised we had something special and I knew the studio was short of money so we offered them $500 cash to buy out their share. They agreed so we borrowed the money.” A great investment when you consider that the song went on to sell nearly two million copies. 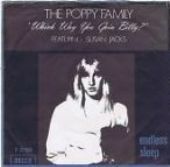 When the song was released it was bizarrely credited to The Poppy Family featuring Susan Jacks. Even more strangely, their last American hit, You Don’t Know What Love Is was credited as Susan Jacks featuring The Poppy Family. So who was bigger? The song went to number one in Canada, number two in the USA and number seven in the UK. Which Way You Goin’ Billy? was their only UK hit although they did have half a dozen further very minor hits in America. They never commanded the accolades of their peers at the time, maybe it had something to do with the fact that Terry didn’t much like live performances whereas Susan did. In 1973 the group split and so did Terry and Susan with both pursuing solo careers. Terry had a UK number one in 1974 with a cover of Jacques Brel and Rod McKuen’s Seasons in the Sun and one further hit with If You Go Away written by the same songwriters. Seasons… was brought to a new audience when Westlife took the song back to the top and was the last number one of the 1990s. Susan managed one minor US hit in 1975 with You’re A Part of Me but despite having an amazing ability for delivering the plainest lyrics in the most emotion and relevant way she decided on a songwriting career in Nashville, and whilst she scored a few minor writing successes there, various wrangling’s over ownership of her solo recordings accounted for the lack of any major recording recognition. In 2005 she was diagnosed with renal failure and underwent a successful kidney transplant donated by her brother Bill, and is now back performing in her native Vancouver in great vocal form. As for Terry, in the late 1970s he married his manager Margaret Zittier and gradually withdrew from the music world. The couple had a daughter, Holly Michelle Jacks in 1985, but the last 20 years he has long been dedicated to environmental causes and has worked in documentary film and video, producing several shorts on environmental themes including The Tragedy of Clearcutting and The Warmth of Love (The Four Seasons of Sophie Thomas).